I’ve very disappointed in my new snowboard purchase. It’s fair to say I have a bad case of buyer’s remorse. I thought I was saving a few dollars by buying online, but at the same time I felt rushed. My gut was telling me not to do it. It told me to wait. But I didn’t listen. I’ll know better next time. My new board arrived yesterday, but I still cannot ride it. It’s missing the M6 hardware needed for my old bindings. Burton will send the hardware to me for free but it means going a few more days without riding the board. 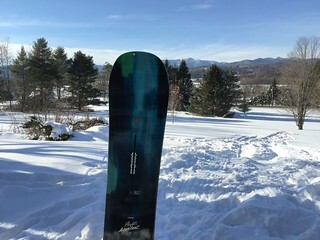 And if I were to buy the board today from AJ’s I would get a 25% discount and they would likely throw in the necessary hardware for my bindings for free. That said, I stopped by AJ’s to buy a pair of new bindings. Why new bindings? I need something to feel good about with regards to this snowboard purchase. Why feel bad? It’s not just the money. Turns out the board I bought is a Burton 2nd. This is a pre-production board. This means it has visual defects with the graphics. The board is just as good as a production board. It’s just that the graphic may or may not have blemishes. And my new board certainly has noticeable blemishes. I feel a bit cheated because the site I bought the board from did not make it clear I was buying a 2nd. The product title had “Blem” at the end, but I had no idea that meant blemish. I certainly would not have bought the board had I known. I thought about returning the board, but then I decided it was more trouble than it was worth. Plus it was my mistake for buying it, so I owned up to the mistake and decided to keep the board. But that’s also why I decided to buy the new bindings. I wanted something to feel good about with this entire messed up purchasing experience. And I have to say, I really like the new bindings. I like the ride of the board too. I’m still getting use to it. I finally took it out for 3 run, wish I had had more time. The board feels like a craving machine. The board is a little longer than I’m use to, and I’m using a wider stance than before, but I’m sure I’m going to love this board as much if not more than my Malolo. Also I learned something from the experience. Buy locally even if the price is slightly higher. Always check in-store locally for the best deals, don’t trust the website. And wait until February, or later, to buy new snowboard gear.